Here is where you will find the latest news items from inside and around CARM. The Golden Horseshoe Chapter of CARM held a meet on April 26th, 2014 at the Royal Canadian Legion in Dundas Ontario. The Golden Horseshoe Chapter of CARM held a meet on April 21st, 2012 at the public library in St. Catharine's Ontario. This meeting started with two layouts open for everyone to vist in the morning after which the formal portion of the meeting was held at the public library. As this was also the annual meeting where the elections of officiers were held. Tony Czerneda remains the Chair and Tom Allan remains Secretary/Treasurer. Congratulations. 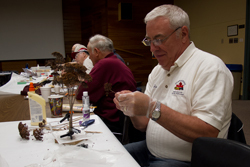 Barry Kelly was introduced and gave a hands-on clinic on making trees. Many of the attendees participated in this activity. The latest edition of the Canadian is now available for the membership to download in the Member Login Area. Just a reminder that the CARM Convention in Regina is coming up at the end of June. Be sure to get your registration in soon to confirm you spot on any tours or other activities. The Ontario Central Chapter of CARM just held elections for the positions of Chair and Secretary-Treasurer so we are pleased to announce the following. Gordon MacBride is now the Chair and Ian Morrison is the Secretary-Treasurer. Welcome aboard as the new chapter officials. We would also like to thank Bill Bradford with taking on both of the chapter official positions during this transistion from the previous to the new chapter officials. The Golden Horseshoe Chapter held a meeting on Saturday September 24, 2011 hosted by the Dundas Modular Railway Club. The meeting was at the club’s new headquarters in Dundas the Branch 36 Royal Canadian Legion. The day started with John Jukes displaying his ONR “ HO” scale layout and then a clinic took place at the Legion. 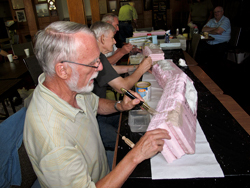 Gerry Wilkinson did a hands on clinic on scenery leading the group in carving the face of the rock on a mountain, making some hills on the top and then applying plaster cloth, ground foam and painting. Two hours went by in a jhurray and the guys really enjoyed the clinic. In a discussion afterwards, those present said they liked the format of having one layout on display before the clinic and then doing the clinic. At two we were done and the guys could head home. We will be doing our meetings this way for the immediate future anyhow. Certificates of Appreciation were given to John Jukes and Gerry Wilkinson. David King, National Chair of Carm was present and addressed the group. Please give them the same support you gave Cloy and me. They will do a great job replacing us. 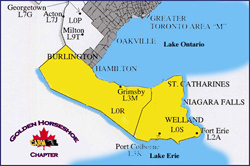 The Golden Horseshoe Chapter held a meeting on April 2nd in Grimsby, Ontario. During this meeting the chapter offical terms were up for election. Tony Czerneda remains Chapter Chair and Tom Allan remains ChapterSecretary/Treasurer. Bob Rivers took the group through various aspects and looking after cars and passed out five pages of notes for the members to keep. weighting of cars was explained and members were given a chance to weigh their car and add weight as need. Wheels were discussed next and members were instructed on the need for wheels to be in gauge and were shown how to use the NMRA gauge. Journals were lubricated with silicone powder. Bob stressed never to use oil. Wheels must also be kept clean. Size of wheels was discussed. Cars on 70 tons or less use 33 inch wheels while heavier cars and passenger cars use 36 inch wheels. Some auto racks use 28 inch wheels. Ribbed wheels are not longer used but were during the steam era. If you have magnets below or in your tracks for uncoupling, you need to use wheel sets with non-magnetic axles. Wheels and trucks were taken off the cars and using rust water based paint the trucks and the wheels were touched with the paint. Make sure you keep the paint off the tread and axle ends. Couplers were then discussed and we were shown how to set the proper height. Couplers should center themselves easily after being moved to the side. If you are using Kadee couplers, file the front edge of the spring with a small file. There could be small burrs that are not seen with the naked eye and they can cause you grief. Also file the parting line off the front face of the knuckle. The height of the coupler can be checked with a Kadee coupler gauge. If couplers are too low, try adding Kadee washers to the truck bolster to raise the body of the car, you can also use an overset knuckle such as Kadee number 42 couplers. The knuckle should match exactly the knuckle on the gauge. Bob also showed us how to fix couplers that sag using a thin strip of styrene under the coupler shank. Coupler pins should clear the shelf of the gauge by 1/32 inch. Coupler mechanism should be lubricated with silicone powder. Bolsters were then discussed and Bob explained that they must be loose enough to allow the truck to swing freely, and also allow the wheels to keep in contact with the rails even over minor track imperfections. You can only check this by operating the car. Bob explained how to use the three point suspension system. A question and answer period followed and some of the members gave input and other ideas to care for cars. Tony Thanked Bob for an excellent presentation and presented him with a certificate from the Golden Horseshoe Chapter. Tony turned the floor to Tom Allan who asked the group if they liked the one hands on clinic and some suggestions were made for future clinic... Members agreed to have another clinic the last week of September or first week of October. Tom advised that as the last two meetings were held at Niagara Falls and Grimsby, the next meeting will be held in Hamilton. 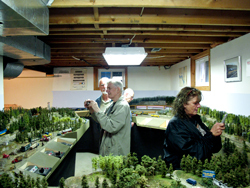 Two layouts, Dave Manary's and Bruce Rousseau's were open for the attendees to visit. At the last meeting of the Vancouver Island Chapter, Ken Cringan was elected as the new Chair. Sterling Stump will continue as Treasurer of the chapter. Ken operated Liesure Time Hobbies in Nanaimo for many years and is well know in our area. I am sure that he will do a great job as Chair. We are pleased to welcome aboard Bruce Harmer as the new Treasurer for the London and Area Chapter of CARM. Don Wesley is the Chair or the chapter and has been doing both tasks as of late. Under the Gallery menu in the Prototype area there has been a number of new images added that were supplied by Doug Thorne, one of our members. Be sure to stop by and check out the new images. More events have been added to our events calendar from various locations across Canada. If you have the time take in one of the events in your area. Who knows maybe I'll see you there! In the members area we have added the latest edition of The Canadian ready for our members to download. Included in this issue is information including the registration form for the Canadian Railway Convention in Ottawa, Ontario in May. 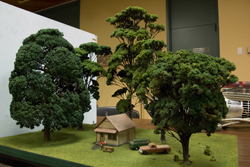 See a sample on Doug Thorne's layout and models. And an article called Gambling on Freight Car Forwarding. A ballot on the future of CARM is there for each member to have a vote. The Golden Horseshoe Chapter had a great chapter meeting with a car and locomotive weathering clinic by Ralph Renzetti and a foam based scenery clinic by Ron Pullano. The meeting also included the visitation of four Niagara Falls home layouts belonging to William Boyle, Stan Conron, Peter Watson and Ron Pullano. CARM is pleased to add Ian McIntosh as the new Membership Manager, Wayne Wessner as the Convention Manager and Walter Reid as the Convention Registrar. With the help of these individuals the organization will continue to grow stronger. Welcome aboard. CARM is pleased to announce the re-activation of the Golden Horseshoe Chapter with President Tony Czerneda and Secretary/Treasurer Tom Allan. The New CARM Website is now ONLINE! The CARM forum is now ONLINE! Click on the link to take a look. Dave Burroughs achieves the CRC Track Four - The Canadian Communicator! Our newest Chapter, the National Capital Chapter! The username/password combination given in the last newsletter will be in effect for the balance of the year. A new membership has been created, Internet Member. An Internet member has all the benifits of membership, lacking only the hardcopy of the CARM newsletter, The Canadian. An internet member can read the Canadian online via the Website on the newsletter page. Are you working on your CRC or YCRC? If you are, please e-mail our CRC Manager to let him know that you are working on it and which Track or Platform it is. If you need assistance or have any questions, do not hesitate to ask him.